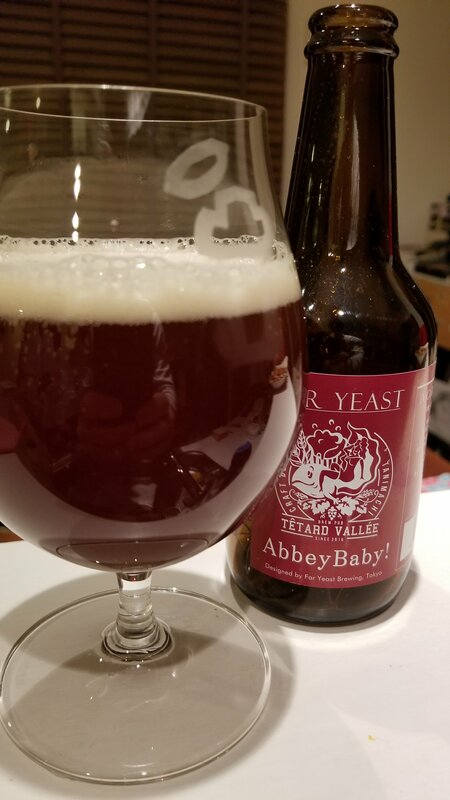 Far Yeast Abbey Baby is a 7% Belgian dubbel from Far Yeast Brewing Company, based in Yamanashi, Japan. It’s part of their collaborative series, with this one being done with Brewpub Têtard Vallée, a craft beer bar in Osaka. It’s brewed using HBC341 after an initial primary fermentation with Belgian Trappist yeast, and then wine yeast in the secondary fermentation stages. Far Yeast Abbey Baby poured out a reddish brown colour with a small amount of slightly off white head, which faded fast. There was an interesting wine aroma to it, with some hints of woodiness, but the Belgian yeast aroma seemed to be missing. There was some hints of fruitiness to Far Yeast Abbey Baby – some plums and oranges came through but they lacked the richness I’ve come to expect from a dubbel. The body also seemed to be lacking the typical rich malts from a dubbel. While Far Yeast Abbey Baby had some semblance of sweetness, it was weaker than expected. Moreover, Far Yeast Abbey Baby was also a tad on the thin side and lacked the strength to hold the beer together. There was a hint of Belgian yeast in the tasting, but it was just too little too late really for me. Far Yeast Abbey Baby isn’t a good representation of a Belgian dubbel as it’s on the thin side for aroma, flavour, and body.